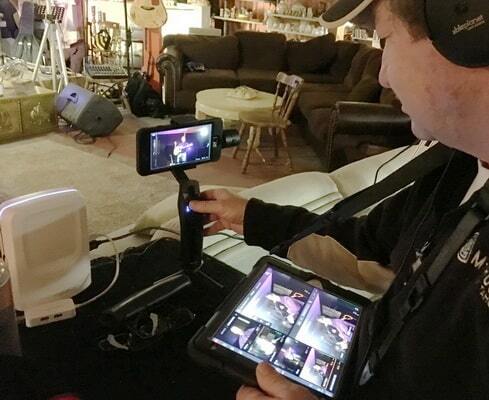 Using a revolutionary videography system, The “Stream Team” (Gary Jesch and Dan Palmer) can live stream and record video simultaneously using the innovative Sling Studio system. Gary is known for shooting band and music programs that last three hours long, by himself, with four to five cameras. He operates a camera on a gymbal in one hand, and a video switcher and audio mixer on the iPad around his neck. Palmer is an outstanding video technician as well as an accomplished musician and performer himself. He knows the importance of great audio and camera angles. He’s also very skilled at the other stages of production, including planning and posting recorded pieces. Contact us today regarding availability and pricing for your next performance or special event.